Note to self: Immediately wake up tomorrow and make Monday's comic right away to end the madness of late updates. Wait, did you just read that note to myself? That note was for me only! Not cool, YOU. 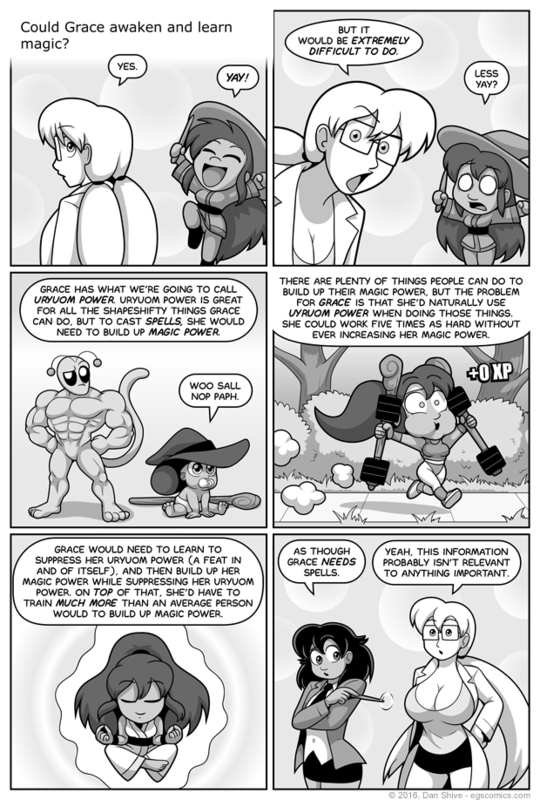 I'm not sure why Grace appears to be floating and radiating power in panel five when she's supposed to be suppressing her Uryuom power. I think I drew what I felt like drawing and pushed logic aside when it tried to "um, actually" me. The last panel, of course, had nothing to do with what I felt like drawing. That was super important for, um... I don't know. Narrative reasons? Yeah. "Uryuom Power" is the result of me originally writing this with sentences with stuff like "the uryuom form of magic" in them, and I was finally like "this is the worst. Just decide on something to call it." Approximately half a second of intense thinking later, "Uryuom Power" became a thing.